This entry was posted on February 28, 2015 at 8:14 pm and is filed under Mathias Enard. You can follow any responses to this entry through the RSS 2.0 feed. You can leave a response, or trackback from your own site. Fascinating review, Grant. I’ve noticed quite a buzz about this novel but had been put off by reports of the single continuous sentence and stream-of-consciousness style. Your review though makes it sounds much more appealing and approachable (and a spy with suitcase full of secrets is hard to resist). Hmm…I haven’t read The Iliad, which could be a problem as I’m sure I’d miss some of the references to Homer. I’ll have a think about it. It’s actually more straight forward to read than you might think. As for missing things, I’m sure this is a novel that would repay a careful re-reading from anyone! I found that the best way to read it was just to plunge in and let it sweep over me. I agree entirely. I can’t say that found it a difficult read (except in terms of the depressing content). I think I might really like this novel based on your description and other reviews, Grant, but it seems you were a little circumspect about confirming whether you liked it much or not yourself–or did I miss something? 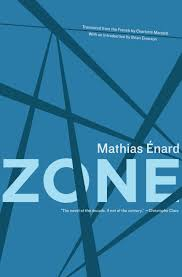 Saying that Zone is “a novel that feels like a weapon itself” sounds complimentary enough, I suppose, but that’s a bit of a double-edged sword if you’ll pardon the expression. Help! How much do you recommend this one? It’s a difficult novel to love (this perhaps explains my circumspection) as it really is unrelenting. I can’t think of a single instance of humour – even dark humour. However, I do feel it’s a very good novel which deserves to be read – I certainly have no regrets about reading it, and would probably read it again as I feel a second reading would be rewarding. I think it’s the tonal tunnel you enter that prevents me proclaiming it a great novel, but I suspect it will still be one of my books of the year.